Nowadays, children no longer like reading. A nice film or series, on the other hand, often still has a good taste. A nice idea is to watch a film with the class and to have the pupils make a poster in groups afterwards. You can also let the students choose a film that they can watch at home as a homework assignment. The poster can then be individually created and presented for the class. For more inspiring lesson ideas, read the entire article. Making a poster, students learn how to convey a message in a short, concise and visual way and what is needed for it. 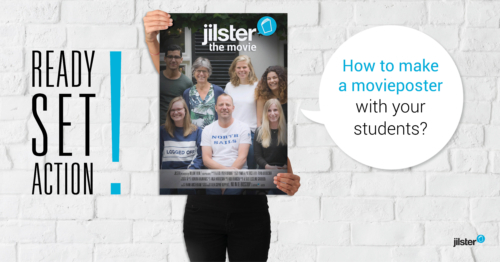 It is also a creative assignment and with the online program from Jilster they have a lot of options.The students only make the cover (front page) with text and photos. The pupils will not only be concerned with the text, but also with the design of the poster. Consider: the layout of images, use of color, the alternation between fonts and font sizes, and so on. The poster must be able to tell at a glance what the film is about. That is still quite a challenge. Movie posters of large blockbusters all have a number of things in common. The title in large capital letters, the names of the actors and the so-called ‘billing block letters’, at the bottom of the poster. Also often the date of when the film is premiered is mentioned. And do not forget, a catchy image that covers the background. The face of the hero in close-up, the female lead character who’s looking badass over her shoulder, or a face that consists of different objects or photographs. It turns out that film posters often look very similar. Consider the arrangement of the main characters, the use of color or the objects that were used to achieve a certain effect with the general public. These are also called ‘movie poster clichés’. It may be interesting to discuss this with the class. Do you want the most beautiful film posters on paper, so that you can hang them up in class? Order the desired number and size and have the posters printed with us. You can choose between A0, A1, A2 or A3 format. Would you rather have the poster printed elsewhere? It is also possible to order a 300 dpi pdf from your page. Then you can arrange the printing of the poster yourself. Let students modernize an old poster or poster, for example J. Howards “We Can Do It” poster from 1943. View a cult movie with the whole class and let them make a poster about it. This can be done in groups or individually. The students can present their own poster in front of the class. Also they can decide together which one is the best. Have the students redesign an existing movie poster of a well-known commercial film, for example a poster of the Harry Potter film series. Have the students copy an existing movie poster. The students crawl into the skin of the main characters that are depicted on the poster. They are photographed in the same way as can be seen on the photo, wear the same type of clothing, and so on. (This assignment can, for example, be performed during dramalessons). Before and after: First let the students see the trailer of an (unknown) film, let them make a poster based on that and then watch the entire film together.